It is so notorious among sailors that you could say the Fastnet Rock is the northern hemisphere’s Cape Horn. Legends have formed around this famous landmark: of storms, and shipwrecks and the terrible events of the RORC Fastnet Race in 1979. So you may find it surprising if you’ve never sailed there yourself, or if you’ve raced there only to turn round and sail 250 miles back to Plymouth, to discover that the Fastnet Rock is just six miles from the Irish mainland and four miles from the closest island. With a fair wind you can be grasping your first pint of Murphy’s within the hour at Ciarán Danny Mike’s on Cape Clear or O’Sullivan’s in Crookhaven. It is geography that has made it so feared by mariners over the centuries. The Fastnet lighthouse stands on small outcrop of rock, off the first land that would have been seen for weeks for those crossing the Atlantic in years gone by. If their navigation was even slightly out…. Often shrouded in low cloud and beset by strong winds and seas from a succession of Atlantic lows, it was a place where ships could – and did – come to grief. Even today, with metres-accurate GPS positioning and radar to ascertain its position, crews are wary of ‘the Rock’. The weather is still as unpredictable as it ever was. As recently as 2011, the iconic lighthouse silhouette was the backdrop the dramatic rescue of Rambler 100’s crew after the maxi yacht lost its keel and suddenly capsized shortly after rounding the lighthouse. The Fastnet Rock lighthouse was built to supercede an earlier light built on a clifftop on Cape Clear Island in the early 1800s. It could, in certain conditions, be obscured by a stratum of fog. An inquiry found this to a factor in the loss of an American packet on nearby West Calf Island in 1847, in which 92 of the 110 passengers and crew were drowned. After that, plans for a lighthouse on the Fastnet rock were drawn up. The tower you see today was started in 1897. There’s a bit of a myth that the rock for it was quarried locally at Crookhaven – not so. Most of the south-west coast is formed of old red sandstone (which actually ranges in colour here from dark grey to green). This is sedimentary rock prone to marine erosion, hence the characteristic striated appearance of the headlands of West Cork. 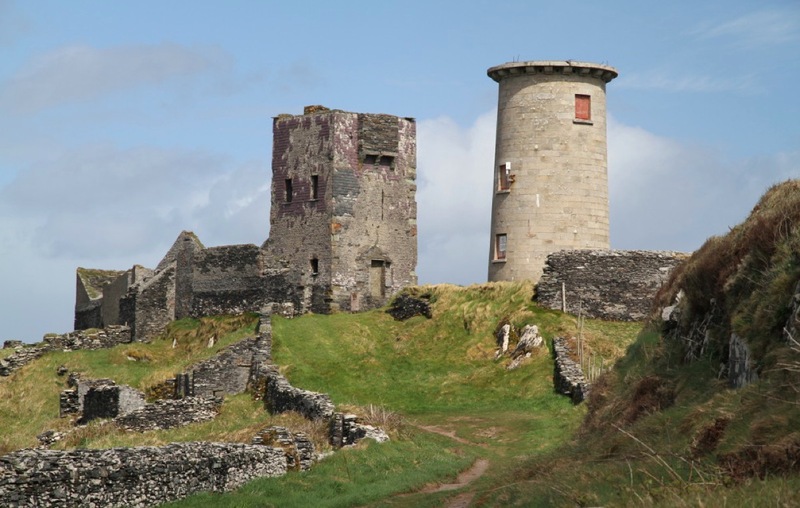 The elegant and beautifully waisted tower structure was designed by William Douglass, an engineer with Irish Lights, and built from coarse-grained Cornish granite that I believe came from the Cheeseswring quarry in Bodmin Moor. Over 2,000 blocks were cut and shaped to interlock one into another. Each course is said to have been assembled in Cornwall before the granite blocks were shipped to Crookhaven and Cape Clear Islands, from which two teams of builders worked over five years. Today, the only visitors to the lighthouse are maintenance teams and inspection tours. Once every two years, the Royal Ocean Racing Club’s Fastnet Race rounds the rock, but no longer does it send a delegation to keep watch in the lighthouse. Today, it stands empty, but its light is still a reassuring beacon.